This is the place to come to if you have any… burning questions to ask me. Please keep in mind that I get asked the same questions very very very often. That’s why this page had to be made. Yes, technically. 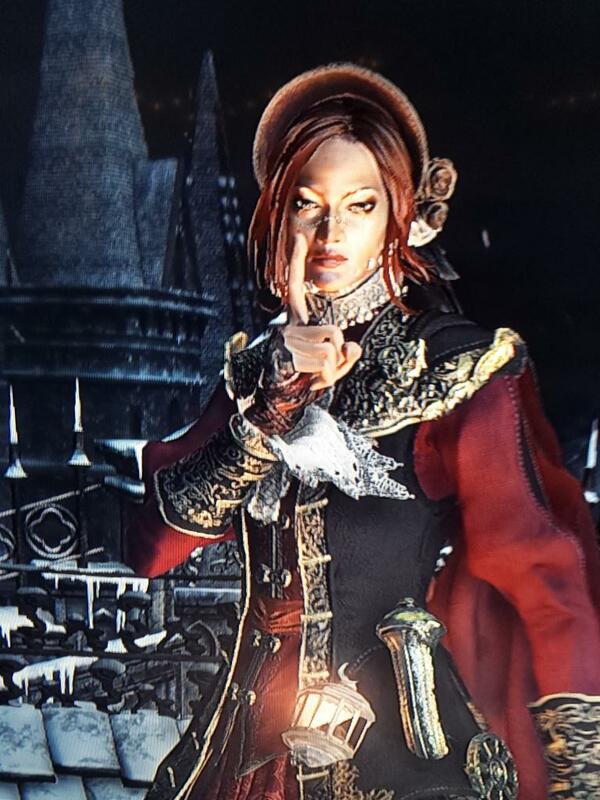 I still need to go kick some booty in the 3rd DLC… just, don’t feel like it. The base game? Yep! I haven’t touched the DLC yet. I consider myself first and foremost a comic illustrator… I have quite a history with comic work, starting with my original story “Time Twisters” back in 1998 which was drawn during 7th and 8th grade. It ended up well over 500+ pages that spanned three sketchbooks. But comics have always been my passion. My last comic project was “3 Pillars“, which was put on permanent hiatus because I wanted to rework the story; I worked on it from 2001~2011 and it consisted of over 1,500+ pages spanning the actual story and holiday specials. I do have other projects I’d like to work on/finish/whatnot; including a sci-fi action horror story “Influenza“, fantasy action “The Ward“, and a fantasy narrative-drama “Etioli“. At this time I have no plans on doing the comic past Dark Souls. The main point being is that I do this comic for no monetary earnings. Since I am a freelance illustrator, I primarily focus my artistic energies working on commission work and other freelance possibilities. Plans were to open up a Patreon for my art/comic/etc, and it would help fund a reason for me to continue on. But seeing as Dark Souls II is kind of an old property I don’t believe it’ll be wise for me to work on it, even though it’s a fairly popular suggestion. This sort of goes for Bloodborne, too. Firstly – thank you for your interest in making a donation to the site! You can donate through my Paypal.me page! Please keep in mind that all monies raised in donation towards KMDiDS goes towards the monetary costs to maintain the website/domain/host. 99.9% of traffic to my domain [noizmaker.net] is through Karniz’s Many Deaths in Dark Souls. All extra monies raised is stored for safe-keeping as is again, used to only pay for the hosting of the website. Donating to the comic will also get you on the Donator page and possibly a commission-type illustration for you! On the subject of learning… to me, “learning” to draw is conceptual based on who you are talking to. Some people went to a college or school to learn to draw, some just… do it. For me, I’m the latter. I always just… knew how to draw, granted it was fairly late in my life [I didn’t consider being an *artist* till I was a junior in high school, so I was 17?] but I never went to any formal school to teach myself how to draw. I went to a ‘Comic and Graphic Art‘ school for one year. I didn’t continue through the full three years because I felt like I was wasting my time… It wasn’t like I felt I knew everything, but it was mainly the closed-mindedness of the [predominately male] students along with the curriculum of the school itself. Other than the fairly competent first-year staff I didn’t feel like I was really learning anything while attending, so I felt it was the cheapest option to just not continue going. This answer comes two ways: pre-digital & digital. 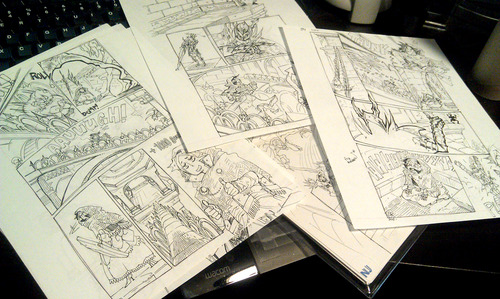 When I first started working on the comic, it was done traditionally on paper and inked in black pen. Here is a photo of the tools I used. The writing on the pens detonated how light the ink flowed… pens that were dying were great for working on backgrounds and other delicate line work. Fresh pens were used for bolder lines. The poop-shaped thing is a kneaded eraser, my go-to eraser of choice. The pencils are a Staedtler drafting pencil, and a red col-erase pencil. Here are some pages! They’re simply drawn on 8.5×11 sheets of cardstock. Here is a closeup on a panel in one of the pages. After scanning the page, I would apply simple shading in a grey palette [and red!] for the comic. I started taking the comic full digital back in January of 2014. Why? It’s faster. Haha. You can view the first primary-story digital page here. [although previously I had done some of the NPC specials digitally.] For me, from start to finish most pages can take about an hour. This includes taking the thumbnail drawing and doing the line work, digital rendering, and lettering/sound effects. Yes, all text and sound effects on the pages are hand-done by me. No fonts are used in the making of this comic. 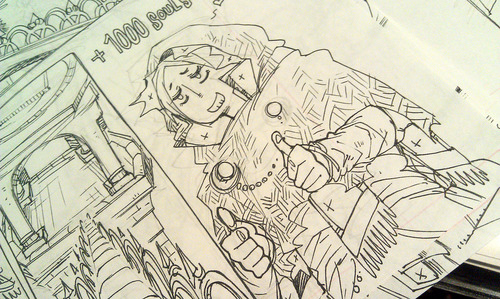 Hell, even the comic panels are hand-drawn by me, I don’t really like to use rulers so they’re mostly free hand. 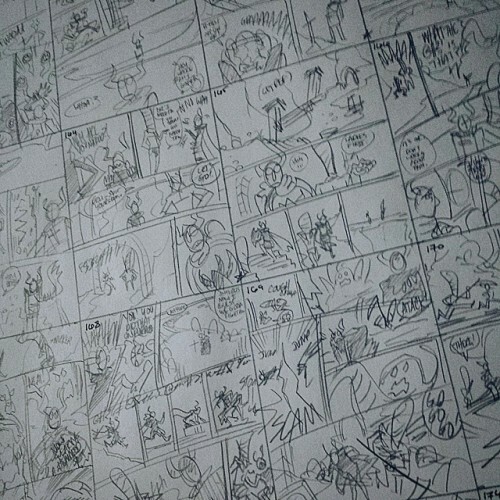 Thumbnails > Panels > Line Art > Flat Colors > Rendering > Hilights > SFX > Text | Done! 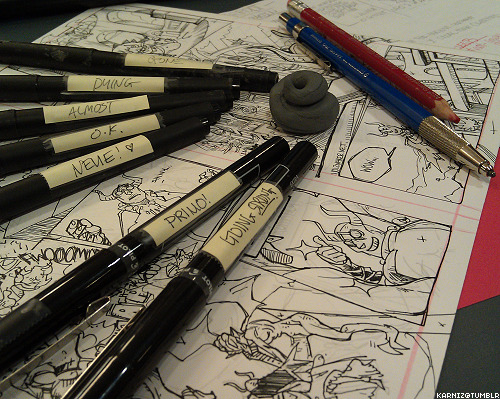 This process is used in all current pages of the comic. I have a Medium Wacom intuos 4 as my drawing surface, and I use Paint Tool Sai/Clip Studio Paint for everything else. Do you have a question for Donna that isn’t here? Feel free to ask below and I’ll add it to the FAQ as soon as I can! Thank you for reading and enjoy the comic! This page was required indeed. I’ve seen how many people try to help with advice lol, despite your constant reminders. I struggle with this a lot, sadly. I don’t think people realize I’ve beaten the game many times already. The requests to help me on Steam are probably the worst. “Let me know if you ever need help!” I just reply with “I beat the game two years ago buddy…” hehehehe. You can go to google or any of the Dark Souls wiki’s for gaming advice on gameplay. Aww. I was joking, but I had hoped for a more whimsical answer. hahaha i’m sure they don’t mean any harm. It’s just when you love a game so much, you try to tell someone! anyone! all the tactics you used, how you passed a certain area. Your comics brings back that feeling when we played this game for the first time. Please keep it up, we’re all looking forward for more! Hmm… I want to thank you for the info… But it’s not needed, seeing as I have beaten the game already. I see where you said you have beaten the game. But have you tried jumping? I have a question for you…did you saved Dusk of Oolacile? I suppose you already bought her wand and sorceries. And yet you found a cloth. I appreciate the question, but you could have easily found the answer by reading the comic! Because it happened a looooooooong time ago, hehe. Ah right. And I forget to mention it about…broken pendant. I mean I already did found this out and I was curious until I’ve gone back to her. It turns out she is gone. 1. what did the 4 kings battle look like? 2. gonna play dark souls 2? 1:) Haven’t gotten there yet, if you hadn’t noticed? 2:) Uhm… I hope this answers that?